Globalisation - the increasing integration of economies in terms of flows of goods, services, capital, people and ideas - has transformed the planet. While it has brought immense benefits, lifting hundreds of millions out of poverty, creating economic growth and increasing the range and affordability of goods and services worldwide, it has not benefited everyone equally and countries and individuals remain vulnerable. 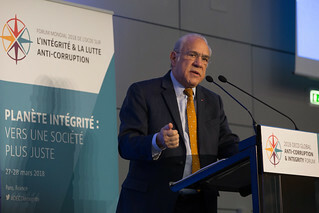 Under the theme “Planet Integrity”, the Forum debated how integrity cultivates a level playing field for business, reduces socio-economic inequalities, and makes public policies more effective - enhancing the benefits of globalisation for all. The debates also focused on the governance of globalisation and its role in curbing corruption and unethical practices in areas such as trade, competition, infrastructure, development co-operation, and revenue collection.